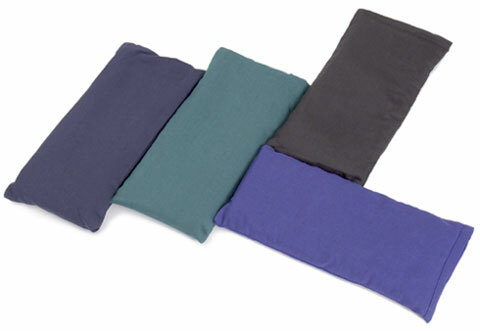 Enjoy savasana fully with our Large Cotton Eye Pillow, filled with natural organic flax seeds. Our eye pillows are made from 100% pure cotton (or choose silk). Choose from several serene colors. This cotton eye pillow has a removable cover that can easily be washed to increase the life of your pillow. You can also remove the cotton cover to adjust the amount of filling. Filled with natural flax seeds, you'll find the soft shape will contour to your face with gentle pressure while blocking out the harsh light. Perfect for deep relaxation and meditation, eye pillows can also be used for headache relief. The cotton eye pillows are available in two sizes. I purchased a dozen of these eye pillows to offer to my Meditation clients. They love them! They are very well made and you can remove the outer cover for cleaning! Excellent! I originally bought the lavender scented eye pillows which are fantastic but I realized quickly many people are allergic to Lavender. So buy these unscented as well. Is a nice eye pillow, comfortable. I put it in a plastic bag, and put a tissue that has drops of lavender oil on it. This is a real treat when you are finished with a class. I keep it in the plastic bag which not only keeps it clean but also sweet smelling. Just refresh the tissue with another one when needed. Nice products at a great price! Very happy with the eye pillows. I still use a tissue under them for the students but now the cover can be taken off and washed when needed. I was hesitant because of the width but they seem to cover the eyes better. This is great tool to use to relax after a long day of work. The product is superb. The size, soft cotton, flax seed stuffing, removeable cover are all surperb. I can''t believe that a product that is so high quality would cost only $6.49!